Last week Bo’s son, Trent, brought his O.K. Foods, Inc., management team to the Abbe House for a series of planing meetings along with some fly fishing on the Little Red River. Mark Harrington and his staff at the Abbe House provided meeting facilities and as always Chef Mark produced some amazing dinners for the group. Our good friend, J.L. “Skip” Rutherford, who is the dean of the Clinton School of Public Service in Little Rock, AR., made a wonderful presentation about corporate responsibility and governance to the group. For this time of year the weather was very cool and with all the spring rains the river is high and at times a bit off color. Most of the O.K. 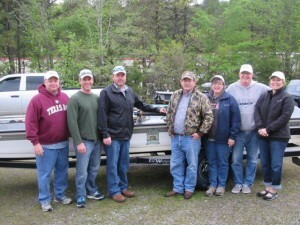 group had never done any fly fishing but our guides were successful in helping everyone catch some fish. 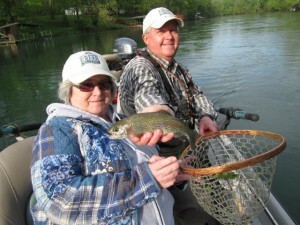 A couple of the anglers caught some nice Brown Trout up to 19″ on a variety of nymph rigs. We had Donna and Natalie in our boat on Tuesday and both were new to fly fishing but as you can see in the above photos it was all smiles with some beautiful Rainbows brought to the boat. If you are interested in arranging a fly fishing getaway for your business group give us a call and we can help with all your meeting arrangements as well as instructional and guided fly fishing.